Antonii Vasiľevich Florovskii (December 1, 1884, Elizavetgrad /contemporary Kirovohrad in Ukraine/ – March 27, 1968, Prague), Russian historian. In 1908, he graduated from the Faculty of History and Philology at the Novorossiisk University in Odessa and started teaching at the Department of Russian History. 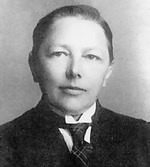 He was also a member of many research organizations in Odessa and became a director of the public library in 1921. One year after, he was expelled from the Soviet Union and through Constantinople, Sofia and Beograd he arrived to Prague. There he taught at the Russian Law Faculty and Charles University as well, he was a member of the Institute of Slavonic Studies, a chair member of the scientific committee of the Russian Historical Archive Abroad, the director of the Russian Historical Society. He was a director of the Kondakov Institute in Prague during its last years (1947-1952). In 1946, he obtained Soviet citizenship but remained in Prague. In 1957, he was awarded by a doctorate. He is an author of several books. The archival file of A.V. Florovskii is quite large. Its main part contains his correspondence and manuscripts. The correspondence (16 boxes) includes private and family correspondence (i.e. 331 letters from his brother, Georgii V. Florovskii) and letters received from various institutions as well. Most of manuscripts are dedicated to the rule of Peter the Great who was in the centre of Florovskii’s professional interest. Other files document Florovskii’s activity in Russian emigration organizations (Russian Historical Society, Russian Historical Archive Abroad, Kondakov Institute). Materials from personal life of the Florovkiis can be also found (the archival box I. A. B) except for photographs. The Slavonic Library got the A.V. Florovskii’s inheritance through dr. Ivan P. Savitskii at the end of 1960th.